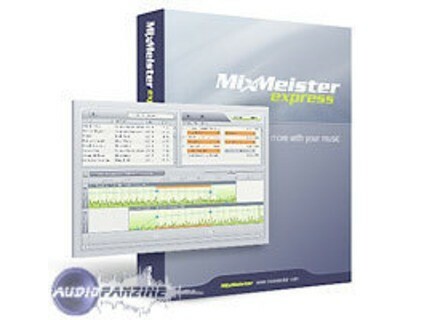 MixMeister Express, DJ Software from Mixmeister. 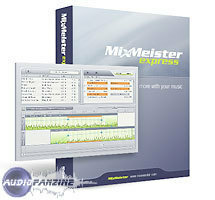 MixMeister Express 6 is a tool designed to be used to create a professional-sounding mix from music files. Express is used by people who want to "let the computer do the hard parts and make their own mix CD in minutes," according to MixMeister. Create mixes, with beat-mixed transitions between songs. Make a song slower or faster to achieve the tempo you need, without changing pitch. Trim long songs down to size or remix short songs to make them last longer. Add one-click special effects for more ways to blend songs together. Create a full-length mix CD (up to 80 minutes), and export your DJ mix to your iPod or other portable audio player. MixMeister Express is designed to automatically beat-mix transitions between songs. The software calculates how best to mix from one song to the next and offers a choice between suggested transitions and more user-defined mixing, according to MixMeister. Users can adjust song tempo to play slower or faster without changing the pitch, trim song length and remix songs and sections. MixMeister Express is currently available at an MSRP of $49.95. More info available on this page.